Q. Hispanics were a key group that supported Barack Obama in 2008. How important a role will they play in 2012? A. Hispanic support for Barack Obama this year remains at levels similar to 2008. Exit polls four years ago showed that Obama won 67% of the Latino vote and John McCain won 31%. The most recent numbers from Pew Research surveys show 70% of Latino registered voters saying they plan to vote for Obama and 26% saying they plan to vote for Mitt Romney. The big question this year will be how many Hispanics, as well as how many in the public overall, turn out to vote. Currently a record number of Hispanics – 23.4 million – are eligible to vote. That’s up from 19.5 million in 2008. And along with the growing number of potential voters, the actual number of Hispanic voters in presidential – and midterm – elections has been on the rise. A record 9.7 million voted in 2008. 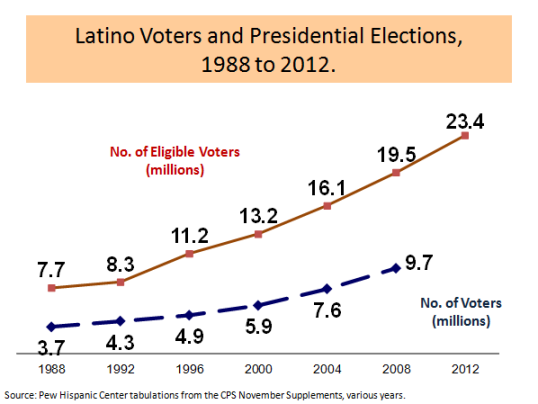 The turnout rate among eligible Hispanic voters also has been on the rise and reached 50% in 2008. But it continues to lag turnout rates among white non-Hispanics (66% in 2008) and black non-Hispanics (65% in 2008). It’s too early to tell how many Hispanics will vote in 2012, but since the mid-1980s, each presidential – and midterm – election has seen a record number of Hispanic voters. Still, 2012 is a different election. Four years ago, the two states with the biggest Hispanic populations and the most Hispanic voters – California and Texas – played a more important role because of the Democratic primary fight between Barack Obama and Hillary Clinton. There was no similar fight this year that went through those states. Nearly half of Hispanic eligible voters live in California or Texas. Most political experts expect Obama to win California and Romney to win Texas. Q. In 2008, Hispanics made up 7.4% of voters nationwide. That’s well below their share of the population at the time – about 15%. Why the difference? A. Hispanics are younger and less likely to hold U.S. citizenship than other groups. These two factors alone explain much of the difference in Hispanic representation among the nation’s voters. Our analysis of the 2010 election showed that more than half of the nation’s Hispanic population was ineligible to vote that year for either of those two reasons. By comparison, three-fourths of whites, two-thirds of blacks and more than half of Asians were eligible to vote. Q. How important is where the Latino populations are located? In what states can we expect Latino voters to play a big role this fall? A. Though nearly half of all Latino eligible voters are in California and Texas, neither is a battleground state this year. States like Florida, Nevada, New Mexico and Colorado are all battlegrounds with significant Hispanic voter populations. Hispanics could play an important role in Virginia and North Carolina too. In Florida, Nevada and Colorado, Latinos make up about 15% of each state’s eligible voters while in Virginia and North Carolina, they compose less than 5% of both states’ eligible voters. In Florida, about 1.5 million Hispanics are registered to vote, up from 1.4 million in 2008. Q. What are the issues most important to Latino voters? A. Jobs and the economy top the list. After that come education and health care. Immigration is also seen as a top issue, but fewer registered Latino voters rate it as an “extremely important issue,” according to a survey we did in late 2011. Interestingly, our research from last year found a majority of Hispanics opposed Obama’s deportation policy, but that was before the president announced recently that his administration would not enforce deportations for some children of immigrants who arrived illegally. Q. What do the demographic trends say about the future? It looks as if there are growing Latino populations in many southern states that could have greater influence in elections going forward? A. This is a gradual process, but one of growing numbers. The greatest recent growth has been in the Southeast, including states like Georgia and South Carolina . Even so, Hispanics are still a small share of the eligible voters – less than 5% in each of those states. Moving forward, Latinos will be a greater share of all voters nationally and in many states. Exactly how this will evolve remains to be seen.